Take education to the next level. Reach students and supporters with digital yearbooks, alumni magazines, and eBrochures that tell your school’s story. Today’s students are already on the cutting-edge of technology—reach them in an instant with interactive apps that bring campus life straight to their mobile device. Simply download our app-producing software and start creating cutting-edge education products today. From e-brochures and college catalogs to mobile textbooks, alumni magazines, course overviews, student guides and more can all be customized to your college or university. The mag+ app-creating software allows you to reach students, faculty and alumni on the devices they use every day—no coding required! When you go mobile with education materials, the world becomes your classroom. 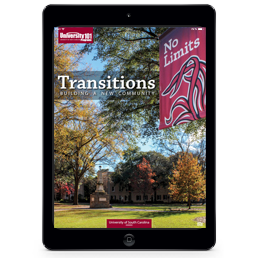 The University of South Carolina turned to Mag+ to create a mobile app as the centerpiece of a class for new students called Transitions. The Transitions app boasts an in-app scheduler that immediately exports the year’s sports schedules, reserves study rooms and includes time logs, email forms and interactive checklists. Create your own mobile apps for classroom use to connect with students on a digital level. Attention Alumni office: bring a modern edge to your alumni magazine by delivering it to mobile devices. 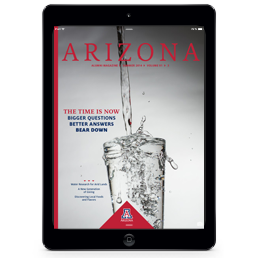 The University of Arizona Alumni Magazine has been transformed into a free app for iPad using Mag+ software. The magazine app includes all of the content readers have come to enjoy from the print edition plus special interactive features. Touch, tap, and swipe your way through photo galleries, short videos and audio slideshows. You’ll save on printing, paper and mailing costs while carrying on the rich traditions of your alma mater. Celebrate the beauty and longevity of your school. 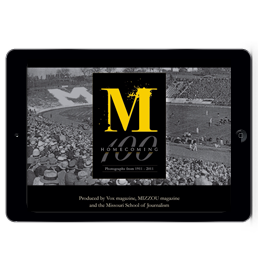 Use Mag+ software to create a photo compilation or historical visual record of your alma mater. Education officials at the Missouri school of Journalism compiled a visual history of how homecoming has changed and stayed the same over the last 100 years. Mag+ makes it quick and easy to create a visual history that’s mobile, shareable and pinch and zoom enabled for a closer look. Leverage the Mag+ mobile app software to create customized mobile content for a variety of uses ensuring that your education institution captures the attention of students, alumni and faculty.